There is nothing—nothing—like seeing a handsome, straight, cisgender, wealthy, able-bodied white man cry to remind us how horrific black people had it during the civil rights movement. Sounds ridiculous, doesn’t it? But that was the gist of the headline over at Gawker christening actor Chris Pine the “face of civil rights.” Why? Because he shed a lone, beatific tear in response to John Legend and Common’s performance of their powerful song “Glory” from the Selma soundtrack at the 87th annual Academy Awards. That’s right: Blond-haired, blue-eyed Pine is a symbol of the black blood spilled by police dogs, billy clubs and Klansmen on roads from Mississippi to Alabama. His face, not that of Selma star David Oyelowo—whose face was flooded with tears that caused a visceral, reciprocal reaction in many black people watching—is mainstream media’s symbol that we have overcome. When I posted the image on Twitter, there were those who thought that Gawker was being subversive, mocking the idea that white tears have cleansing power. In a perfect world, that perspective would make sense. But in a nation steeped in the blood, bones and sinew of desecrated black bodies, where so-called allies become heroes and people of color are forced into the margins of our own stories, I have no reason to believe that this time is any different. For the first time in six years, the Oscars ratings dipped—down to an estimated 36.6 million viewers. Though mainstream media has yet to acknowledge the success of her efforts, it wouldn’t be a leap in logic to assume that the abysmal showing was due in part to April Reign’s #OscarsSoWhite boycott in protest of the fact that not one black actor was nominated in any category. This makes it even more egregious that a white man’s tear has become the viral takeaway from a whitewashed award show where most black people in attendance were only there to perform and to present awards to their white counterparts. The message here being that we can dance and sing for their entertainment, but we shouldn’t expect to be acknowledged for talent not done in their service or for their amusement. For the white women who seem baffled by the backlash from black feminists against Patricia Arquette’s tone-deaf post-Oscar statement about wage equality, which amounted to a rendition of “[White] Woman Is the N—ger of the World,” see any of the links above. Octavia Spencer, who in 2012 became only the fifth African American to win best supporting actress honors for her portrayal as a maid in The Help, introduced Legend and Common by sharing that the Academy Awards postponed the telecast 47 years ago to pay homage to Martin Luther King Jr. For the “Glory” performance, the duo re-created the Edmund Pettus Bridge, the location of Selma, Ala.’s “Bloody Sunday” and a gut-wrenching reminder of the lives lost and forever changed in the quest for civil rights. This raw, fearless performance was done despite the shutout of black actors, a continuation of the grace, dignity and commitment to equality that African Americans are known for in this country. But what is the face of civil rights? What warrants mainstream media’s swoons, heart flutters and white fists of solidarity? 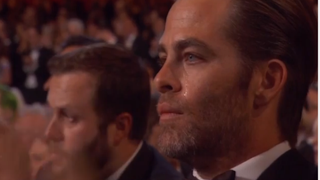 Chris Pine’s tear surrounded by a blinding sea of whiteness—the same group of people who couldn’t even bring themselves to say #BlackLivesMatter at the Golden Globes but had no problem proclaiming #JeSuisCharlie. Unfortunately, this is a lasting legacy of civil rights in this country: white reaction to black pain being perceived as more powerful than black reaction to it—and even more powerful than black pain itself.